Paperback, 256 pages, 11.8 x 18.7 cm, 4.6 x 7.4 in. Did you know that J.K. Rowling did not write only seven Harry Potter books but eleven, the last four exclusively for China? That every trip by taxi is like a death trap? That the standard Chinese reply, "No problem" means the exact opposite? You mean, you can't stop shaking your head? 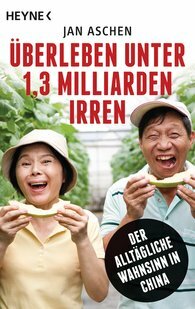 Then you know how Jan Aschen feels, who lives as a German in Shanghai and ever since his arrival has been wondering whether he should find China fantastic or whether he is fighting for survival in the midst of 1.3 billion lunatics.